My latest PopMatters article is now live: Overcoming the Fate of the World. I originally purchased Fate of the World because I thought it might prove an interesting case study for a potential paper. Not only is the game perfect for that reason, but I was genuinely surprised to find the game incredibly compelling. Time and again I have tried to defeat the second 'Oil Crisis' scenario without success. Bur rather than deter me, I have only become more committed to handling the world's problems. Can you really just walk away from the endangered pandas? Believe me when I say Fate of the World is rich and complex. I have not nearly explored all the game has to offer, and somewhat intentionally. It is interesting to examine the sorts of decisions players choose not to make because of their own beliefs and valuables. 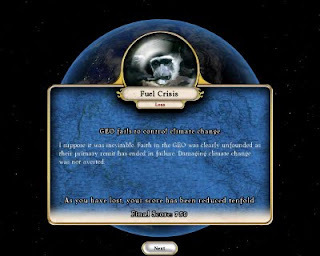 For example, Fate of the World allows you to deploy a set of political policies to influence regions. At first I was very resistant to the idea of meddling in the affairs of other nations. Instability eventually ran rampant and led to a series of famines. Eventually, I began providing increased security to stabilize vulnerable regions. To some extent, the game forced me down an undesired path of political and military involvement internationally. Of course the game is peddling its particular procedural rhetoric. In this case, seriously addressing development and climate change demands the capacity and willingness to make difficult political decisions. However, there are far more drastic measures you can take, including funding black ops or instituting regime change. Choosing to ignore those options without even knowing the effect the might have on the world is a personally meaningful ethical decision. The same goes for many of the policies and strategies you might use to employ or ignore. Some educational games exist solely to encourage personal exploration of the game's subject matter. Fate of the World manages to evoke the same introspection about a variety of issues while also fostering complex systems literacy. This dual achievement alone makes the game well worth out attention.